The Great Ocean Road runs for 243 kilometres of road along the southeast portion of Australia in Victoria. It extends between Torquay and Allansford and was designed to be a memorial to all of the honored war dead from the First World War. As such, it is recognized as the world's largest memorial to any war in history. It's one of the main tourist attractions in Victoria, and runs past many of that region's most notable landmarks. It also happens to be a great way to organize your travels in the Victoria region, while taking in many of that state’s most iconic attractions! With lush landscape and a host of landmarks along the way, your trip along the Great Ocean Road is sure to be one that will make memories that last a lifetime! Located at the start of the Great Ocean Road, the Aireys Inlet Holiday Park is a great place to set up camp during your journey along the Great Ocean Road. With the flawless beaches nearby, and Split Point Lighthouse looming over the landscape, you'd be hard pressed to find a more idyllic spot to rest from your adventures. 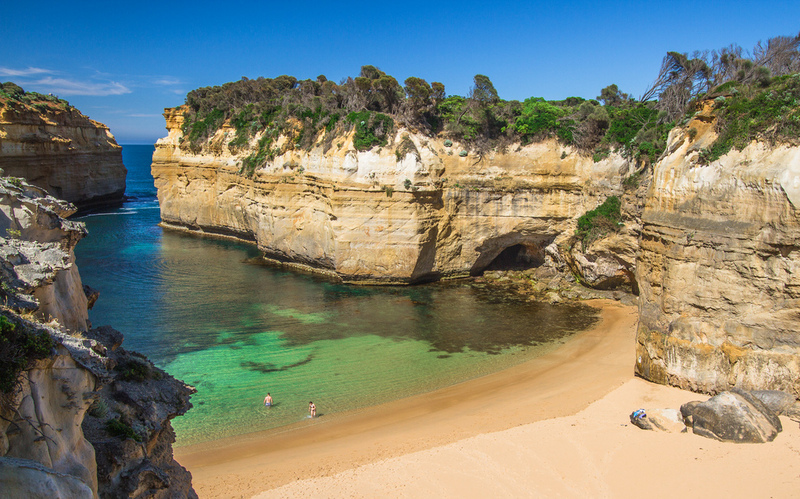 Its temperate climate makes it the perfect place to get in a little fishing, swimming, surfing, or horseback riding at the beginning or the end of your Great Ocean Road drive! The camp offers a camp kitchen, recreational lounge, spa, showers and full amenities block, barbecue areas, and a heated pool. Rates can vary. Call to confirm. This park is located in the Otway Ridges on the Wye River. With bush and beach all around and through the park, you'll enjoy modern camping with nature at every turn! You'll also be treated to kangaroos, koalas, and other animals and birds who like to make their way into the park on a regular basis. The park comes complete with all the amenities you're accustomed to, as well as a jumping pillow, playground, store, restaurant, and bakery. They even offer a games room and surfing lessons for those new to the sport. If you want to enjoy both the beach and the bush, then Angelsea is the place to be. Fortunately, the Angelsea Beachfront Family Caravan Park is there to put you up for the night! It has a large pool, bowling and tennis area, gym, jumping pillow, beach volleyball court, mini-golf, and all the amenities you'll need for an enjoyable and comfortable adventure within an adventure as you make your way along the Great Ocean Road! There is no free camping along the Great Ocean Road. In fact, the rangers or police are quick to tell you to move along if it even looks as though you're trying to stay the night in any given viewing space or parking area. And no, you can't just pull over along the side of the road and set up camp either. Your best bet is to plan on a stay at a caravan park in one of the many towns along the route.